Prep and Cook Time: about 1 hour, plus cooling and chilling time. Butter a baking sheet and set aside. In a medium saucepan over medium-high heat, add 1 1/4 cups sugar to 3 tbsp. water and cook, without stirring, until sugar begins to melt. Cook, swirling pan, until syrup turns dark amber, 10 to 13 minutes. Remove from heat and pour 1/3 of the caramel into a 2-qt. custard mold or a deep-dish pyrex pie plate, tipping mold so caramel covers bottom. Pour almonds into remaining caramel, quickly stir to mix, and pour almond caramel onto buttered baking sheet. Once brittle has hardened, break it into shards and set aside in a cool, dry place. Preheat oven to 325° and set oven rack in the middle. Bring a large pot of water to a boil and keep hot. Meanwhile, in a small saucepan, combine cream and vanilla bean and bring to a simmer, stirring occasionally (do not let boil). In a large bowl, whisk together eggs, egg yolks, remaining 1/2 cup sugar, and salt. Remove vanilla bean from cream, scraping remaining seeds into cream, and slowly pour cream into egg mixture, whisking constantly. Pour egg mixture into a blender, add dates, and whirl to purée. Pour date custard mixture into the caramel-coated mold. Set mold in a casserole and pour the hot water into casserole until it comes halfway up the sides of the mold. Bake custard in water bath until custard is set and barely jiggles in the center, about 40 minutes. Let custard cool in water bath. Remove, cover with plastic wrap, and refrigerate at least 6 hours. Run a thin knife around edge of the mold, put a serving plate on top, and invert it. 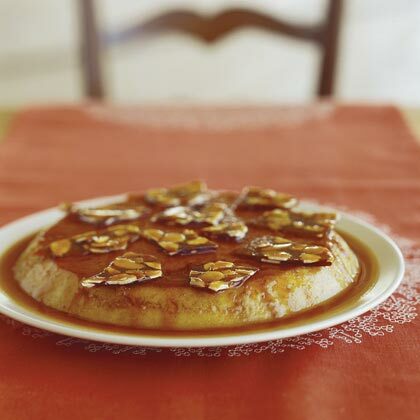 Top custard with almond brittle or serve with brittle on the side.